The Sun Valley Lodge is a classic American ski lodge located in the heart of ski territory in Idaho. It features upscale overnight lodging with traditional amenities, an enormous spa, a 24-hour fitness center, and unique dining options. 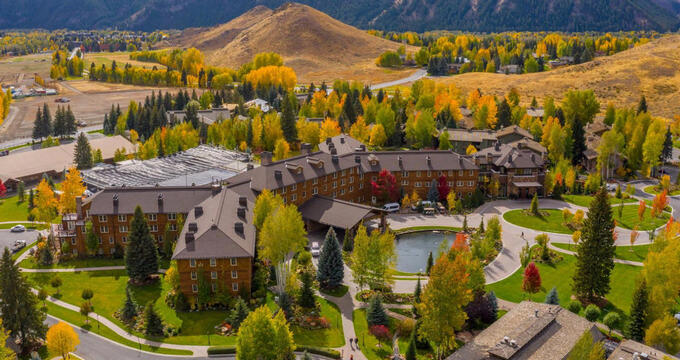 Sun Valley Lodge has multiple options for overnight lodging including 108 recently expanded and renovated guest rooms. The Lodge Premier King guest room offers a large bedroom with a king size bed and a private bathroom that includes a soaking tub and separate walk-in shower. The bathroom also has double vanity sinks. The Premier King also features a large dressing area. This is the standard, traditional guest room offered at the lodge. The Lodge King Suites and the Lodge 2 Queen Suites are larger in size and features an additional living/seating area for guests that has a fold-out sofa to accommodate additional overnight guests. The King Suite has a king size bed, while the 2 Queen Suite offers two queen size beds. Guests are also provided a more substantial dressing area that includes built-in cabinet dressers and a ski closet. The bathroom in the King Suite has a separate soaking tub and walk-in shower and double vanity sinks. Some of these suites also have a fireplace. The Lodge Rink View King Suites and the Lodge Rink View 2 Queen Suites offer the same amenities as the regular suites, but with the extra benefit of providing a view of the outdoor rink area of the resort. For additional views, Sun Valley Lodge offers the Lodge Terrace Suite. This suite offers guests panoramic views of the resort with a king size bed and all the amenities of the more traditional suites. The most luxurious suite offered at the lodge is the Lodge Celebrity Suite. There are five of these suites available, and all are named after famous guests who have stayed at the lodge - Sonia Henie, Marilyn Monroe, Clint Eastwood, Ernest Hemingway, and the founder of the lodge, Averell Harriman. Considered a “parlor” suite, it features a separate living area and king size bed. The bathrooms are the largest at the lodge as well. All lodging comes with at least one flat screen high definition television, in-room safes, mini refrigerators, and iHome brand clock radio and charging docks. They also have coffee systems that come with a selection of complimentary coffee and tea options. Sun Valley Lodge also provides complimentary wireless internet access to all overnight guests. Concierge services are available free of charge to help assist guests with dining, transportation, spa, skiing, and other general services and questions. Contact the front desk for additional information. The lodge also has a large (over 20,000 square feet) spa on-site. The spa offers guests a choice of signature treatments performed by trained spa professionals, like body rituals, massage therapy, salon services, and health and wellness services. Massage therapy options at the spa can be purchased for either 50 or 80 minutes, and include most of the traditional spa options - deep tissue/therapeutic, hot stone, prenatal, and Thai massage. They also offer a softer, signature massage and more unique options like the salt stone massage. Massages can also be performed in the room both during and after regular spa hours, and couples massage is available as well. The spa offers four different body rituals, which last for 110 minutes and include either a dry brush exfoliation or a body wrap followed by a body massage using different oils and herbs to enhance the experience. The salon services at the spa are plentiful. They include the more traditional services like manicures, pedicures, and skincare and include haircuts, colors, treatments, and lash, eyebrow, waxing, and makeup services. Health and wellness services are also available at the spa. These services include acupuncture, cupping therapy, and Reiki. Each of these services can be purchased for 50 minutes, and acupuncture can be extended into 80 minutes if desired. Bathing rituals can be added to any service as well. There are five options, varying by the type of herbs and oils used in the bath. All bathing rituals last 25 minutes. There are also other treatment enhancements available, including hair and scalp treatments, full body exfoliation, and body wraps. Also on-site is a full-service fitness center as well as a yoga studio. The fitness center allows guests use of their state of the art cardiovascular equipment including spin bikes, elliptical machines, treadmills as well as weight machines and free weights. The yoga studio offers multiple class options for yoga a few days a week. Guests can choose from the gentle flow, restorative, vinyasa flow, or HIIT, all taught by trained and certified yoga instructors. The fitness center never closes to lodge guests. Sun Valley Lodge also has an outdoor pool (enclosed in glass for swimming year-round). The pool is heated, and there is also an attached shower, and locker room for guests use before or after a swim. The pool also includes its own cafe, where resort guests can order both alcoholic and non-alcoholic beverages or a selection of lunch options. There is also a jacuzzi on-site. Located at the resort is the Trail Creek Cabin restaurant, which is accessible by sleigh. The restaurant serves a menu of hearty American classics, and guests can choose from trout, buffalo, or new york strip steaks with a selection of traditional sides like mashed potatoes, fresh vegetables, or salads. There are also multiple lounges and grab and go options for guests to enjoy while visiting. The top attraction at the Sun Valley Lodge is skiing. Lift tickets and mountain passes can be purchased on-site, or guests can take part in the SnowSports School. The staff at the school will help each guest, no matter their experience level, learn how to understand skiing better and improve their own skills. Group and private lessons are available, and there are two ski shops at the lodge where guests can purchase equipment and apparel.